Having owned and worked in numerous lofts around the world, over a period of 30 years, I have seen and been part of some of the latest technological advances in sail making history. 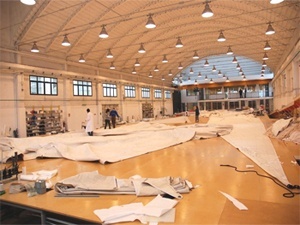 Sail making however, has never been the focus of my businesses, simply because of the cost of the space required to build a sail and the time it takes to train staff. It is more profitable to make the curtains for a five star hotel or specialized awnings than it is to fabricate a sail and you don't have to deal with the all the races and various yacht club politics. If a client wishes a suit of sails I normally accommodate his requests and have built some beautiful sails. I have however, built sails with Mark Plough - Doyle Plough Sails on City Island New York and with Doyle and Quantum Sails in South Africa amongst others. Whilst in Panama, I set up the first sail loft since Black Beard on the island of Taboga, where we built a number of sails for various cruising boats and a few tall ships. Living my life on the water and with over 60,000 nautical miles of sailing, I have had to repair sails on the go and have had the opportunity to see what works best for different boats and their owners under different circumstances. Just one look at a genoa or a main and one can tell instinctively how it is going to perform. One look at the running rigging and I know the history of the boat and have an idea of how many owners she has had and what their level of seamanship has been. If you require advice on a new sail, or which would be the best system for your boat, you are welcome to call. I am always happy to meet new clients and share my experiences. Having owned and worked in numerous lofts over a period of 30 years, I have seen some of the latest technological advances in sail making. The sails designs below are a guide to standard sail styles available . I often suggest a combination of styles to accommodate each client or boats requirements. Sail making however, has never been the focus of any of my businesses. Simply because of the cost of the space required to build a sail and the time it takes to train staff. It is more profitable to make the curtains for a five star hotel or specialized awnings than it is to fabricate a sail from scratch. If a client wishes a suit of sails I will work with a local sail loft to design the best sail for the boat. I have built sails with Mark Plough - Doyle Plough Sails on City Island New York among others. Whilst in Panama, I set up the first sail loft fot over 100 years, where we built a number of sails for various cruising boats and a few tall ships. Just one look at a genoa or a main and one can tell instinctively how the boat is going to perform. Sail design, cloth and material characteristics go hand in hand. Depending on what you are looking for the sail designer will create a design to fit your budget. Having worked in and with various lofts around the world and having owned my own loft I work with designers and sail makers to optimize my clients sail designs. I generally work closely with the boat owner to ascertain his requirements prior to giving a quote and measuring the boat. From inception, I have been committed to making sailing more enjoyable and satisfying for my customers. My commitment to the cruising sailor has been to make sailing easier and increase the performance of their boats. Premium Blue-Water sails that are engineered for offshore performance oriented cruising and durability. The Dura-sail is still considered one of the most durable and economical sails around, it is not surprising to see how many of the original Dura-sails are still going strong. The Doyle superior engineered sails, designed by Bill Durant who understands how sails get used, has allowed us to build a better, more durable sail. Where there is an alteration that is too small and costly to send to a larger loft or when the boat is too far away from a loft to take measurements, I will fill in the required service. Having measurements taken correctly and visibly inspecting the rigging and running gear is of paramount importance to the design of the sail. 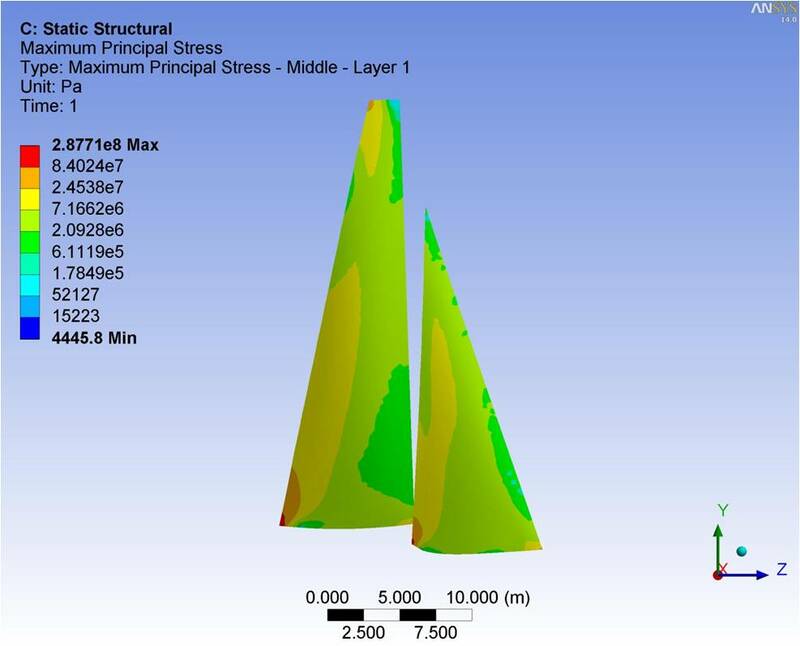 As the diagram shows, the sail is made from a light weight material cut into cross-cut panels that, when put together with broad seaming, achieve the 3-D shape created by the sail designer. Next the sail is reinforced with a grid of narrow high-strength, low-stretch tapes that are bonded to the sail 11 at a time in an 8 inch (20 cm) wide path. Molded sails are where the Grand-Prix market has gone. I started building the foils and molds by hand to form the patterns and laminate sails on. However, with new CAD tech we can now adapt aircraft software used for ultralight foil design to form the leading edge shape. Traditional pattern cutting and sewing still is a close second to molded sails. They last longer due to the materials used and are less sensitive to UV damage or wrinkling damage caused by brittle materials. Using pre-laminated commercial cloth and materials in addition to welding and laminating technology and techniques, can yield a superior foil with longevity and the ability to repair crew neglect and damage from improper storage. New fabrics are coming on to the market all the time, check with your local sail maker to see what is the best available choice of fabric for your requirements. Or, call me. Designing and building the right head gear for your sail, mast and rigging systems can sometimes be a challenge. Optimizing the functionality of the sail is often the job of the head of the sail. This is a very important part of the sail. When in a jibe or high winds the head need to function smoothly and hold the body and leach in the correct angle to the wind. This is especially true when the head holds shivs for the adjustment of the leach line, or when there is an extended roach to the sail. Stand-off shivs need to be catered for in these designs. I always like to finish a sail nicely. Sometimes just a few more hours of hand finishing can really make the difference. Whether it is covering the clew in a leather or adding straps and covers to the velcro adjustments for a leach line or just a simple pocket to store the leach line in will extend the service life of a sail by years. Besides the aesthetic value , there are just some jobs a machine cannot do. Diligent sail care and maintenance will insure that your new sail lasts as long as possible. We recommend that your sails be inspected and serviced once a year. The sooner any chafe, mildew, or other problems are detected, the easier it is to take care of them. Dillon will inspect all stitching and hardware prior and during installation . For winter storage, your sails should be stored dry and free of salt. They should be folded without any wrinkles and kept at room temperature. Sail care starts with learning how to properly set and trim your sails. If you let your sails flog and flap in the breeze, the sailcloth will be broken down quickly and become prone to tearing. Understanding where to correctly position your genoa leads and how to maintain proper halyard and sheet tension will lead to a properly set sail. Be sure to keep the leech line adjusted so that the leech does not flutter. Properly set sails last longer, and you will experience improved performance. With correctly set sails, your boat will have a better chance of sailing up to its potential. 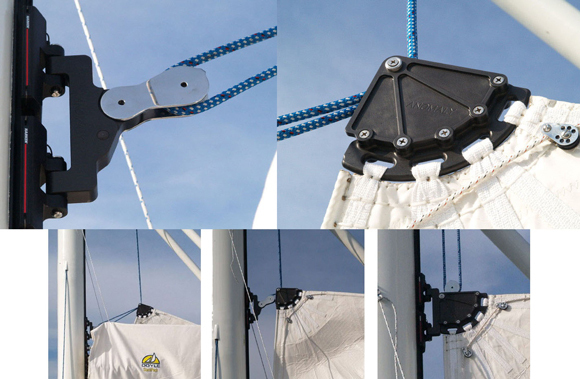 For more information on proper genoa leads, halyard tension, and sheet tension, please read the Doyle Sails Genoa and Mainsail Trim Guides. Depending on the number of hours and type of use, it will become necessary to wash your sails. Washing serves two purposes: First, it rids sails of salt, dirt, and other contaminants. Salt-encrusted sails are harder to handle, and because salt is a crystal it will shorten the life of your sails. Second, washing helps remove unsightly oil, grease, rust, and mildew stains. Sometimes sails pick up oil from touching various parts of the boat such as the mast, boom, spreaders, bow pulpit, and stanchions. The removal of these types of stains starts with trying to emulsify the stain. An automotive de-greaser such as Simple Green® will help to break down the stain. Follow with a mild soap and a thorough rinsing. How long the stain has been left on the sail will dictate how much elbow grease you’ll have to use. Most sails will eventually end up with mildew stains. The most common chemical used to remove mildew is sodium hypochlorite—commonly known as bleach. Most mildew disappears quickly when bleach is applied—if doesn’t, the stain probably will not come off. A thorough rinsing is needed after applying bleach. Note: Bleach will not affect polyester (Dacron), Spectra, or Vectran fabrics. DO NOT use bleach on nylon, aramids (such as Kevlar or Twaron), or Technora. Bleach will destroy these fabrics. BMS Mildew and Stain remover and treatments will remove stains and protect your sails for up to 3 years depending on the coating you purchase. The luff length of the sail divided by the foot length. The direction diagonally across a piece of fabric at 45 degrees to the warp and fill. The number of fibers per inch in the warp or fill. Permanent, continuous elongation of a fiber under a sustained load. The "waviness" of the fiber or yarn when it is laid over and under fibers or yarns in a fabric. Crimp can contribute to the elongation of a fabric under load as it is "pulled out" of the loaded direction and "pushed into" the less heavily loaded direction. A sail panel layout in which the seams run roughly parallel to one another, typically perpendicular to the leech. A measure of the weight of a continuous fiber filament. It is the weight in grams of 9,000 meters of a given fiber. The lower the number, the finer the fiber. Higher denier, heavier fibers are generally more rugged and durable. A measure of the fabric's relative weight and strength, expressed as the number of fibers per inch, generally in the primary yarn direction. The difference between the initial length of a fabric sample and its length after stretching, expressed in 1/100ths of an inch. The basic entity that is twisted into yarns and then used in the production of a fabric. A single fibril of natural or synthetic textile fiber. Filaments are twisted or bunched to form fibers. The yarns or fibers that run across the width of the roll of fabric, perpendicular to the warp direction. An extruded sheet of plastic, most often Mylar ® polyester film. Film's desirable properties include low stretch, good bias stability, low porosity and good adhesion. Less desirable properties include low tear strength and relatively high physical shrinkage (due to creases and folds in the film). The ability of a fiber to retain its strength after being folded back and forth, commonly expressed as percent loss in breaking strength after flutter or fold testing. A subjective term for the way the fabric feels when touched. Terms like softness, crispness, dryness and silkiness all describe the hand of the fabric. A measure of a material's ability to resist stretch. Initial modulus is usually expressed as grams of load per unit stretch for a certain fiber denier. The higher the initial modulus, the less the fiber will stretch. A yarn or fiber laid directly into a fabric without first being woven or put into a scrim. Fabric constructed from layers of film, scrim and/or taffeta glued together under high pressure and/or heat to form a composite sail material. The direction that is most resistant to stretch, typically due to a higher yarn count or a higher modulus fiber. A panel layout where the seams and panels radiate from the corners of the sail in the direction of the highest load. Weight in ounces of a piece of fabric measuring 28.5" x 36". A base fabric component created by laying out fibers in a grid pattern with the fibers joined at their intersection. A scrim can be constructed by passing fill and warp yarns over and under one another; by knitting, in which the fibers and "tied" at each intersection; or by laying the fibers straight across one another and connecting them at the intersections with glue. The tensile stress at rupture of a fiber expressed in grams of force per denier. Tenacity relates to the breaking strength of fibers and should not be confused with modulus, which relates more directly with a fiber's ability to resist stretch. TENSILE STRENGTH A measure of the ability of a fiber, yarn or fabric to withstand pulling stresses. THREADLINE The direction of the fibers or yarns in the warp, fill or bias. A measure of the effect of sunlight on cloth. UV resistance is usually expressed as the time it would take for a material exposed to sunlight to lose half of its breaking strength. The yarns or fibers in a fabric that run the length of a roll of cloth and, in a woven fabric, are interlaced with the fill (weft) yarns. Material made by interlacing fibers over and under each other in a regular pattern. Types of weaves include plain, leno and basket, among others. A continuous strand of fibers created when a cluster of individual fibers are twisted together. Yarns are used to create fabrics.